Yesterday, the government announced that the UK’s Prevent counter-extremism programme is to undergo an independent review. The review, to start within six months, was proposed by the House of Lords as an amendment to the Counter-Terrorism and Border Security Bill. Our CEO Sajda Mughal OBE has been lobbying for this decision along with other organisations such as Amnesty International, Liberty and Human Rights Watch. “JAN Trust and myself welcome the news that there will be an independent review of the Prevent programme, which was announced by Security Minister Ben Wallace yesterday. I have worked with Prevent for well over a decade and saw first-hand the changes that needed to be made and the failings of the strategy. I have been lobbying for an independent review of Prevent alongside many other organisations and individuals; an article outlining my concerns about the programme was published in The Times on the 9th July last year. 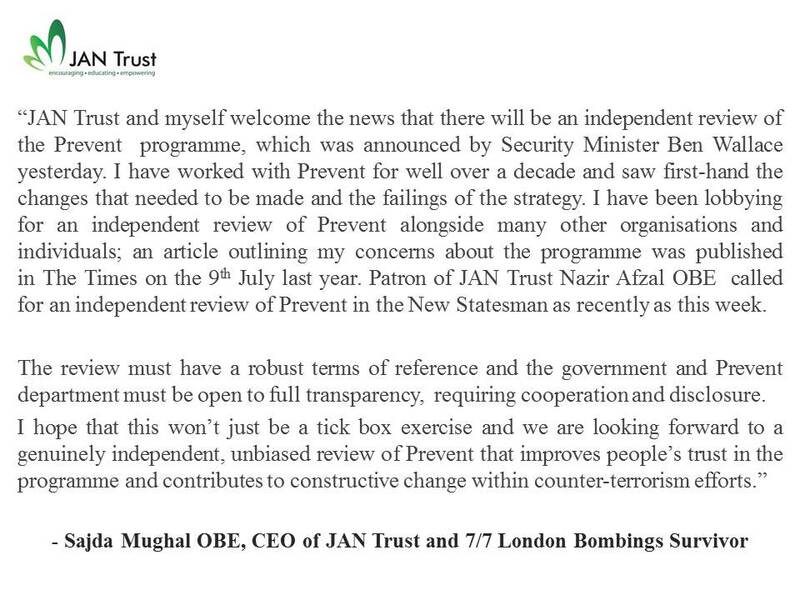 Patron of JAN Trust Nazir Afzal OBE called for an independent review of Prevent in the New Statesman as recently as this week. Read Sajda’s piece in The Times here. Read Nazir’s New Statesman piece here.